This unusual three-layered sponge is made with fresh mango and pineapple, and limoncello liqueur. There’s also tropical fruit in the cream filling and as decoration – with enough leftovers to make a tasty smoothie. Step 2 – First, make the sponge. Using a tea towel squeeze out the excess liquid from the mango and pineapple pieces. Tip them into the bowl of an electric stand mixer fitted with the whisk. Stir in the sugars and the citrus zests, then whisk in the eggs until they’re frothy and thick. Step 3 – Sift the flour and baking powder into another bowl, then gradually add the mixture to the fruit, whisking on a very low speed until incorporated. Add the limoncello. Step 5 – Bake the sponges for 30–35 minutes, until golden and a skewer inserted into the centres comes out clean. Leave to cool in the tins for 1 minute, then turn out onto a wire rack to cool completely. Step 6 – Meanwhile, make the fruit purée. Blitz the mango pieces in the processor or blender until very smooth. Pour 225ml of the purée into a clean bowl (save any extra for smoothies). Purée the pineapple, then add 175ml of the pineapple purée to the mango in the bowl. Mix in the limoncello. Set aside 100ml of the mixture, cover and chill it until needed for decoration. Step 7 – To make the cream filling. Whisk the cream with the icing sugar and the lemon and lime zests until floppy. Add the remaining fruit purée and the limoncello to taste, then whisk until the mixture is thick enough to pipe. Transfer to the large piping bag and chill until needed. Step 8 – To assemble, trim the sponges so that they are level. Place a larger sponge top-side down on a cake board. Snip the end of the large piping bag and pipe ‘kisses’ of fruit cream over the sponge (leaving enough cream for the next two layers). Step 9 – Transfer the chilled fruit purée to the small piping bag, snip off the end and drizzle over the cream. Top with the second larger sponge, top-side up, and repeat. Step 10 – Put the small sponge on top of the second layer, top-side up. Pipe more cream ‘kisses’ on the top and around the base of the cake, and on the exposed edge of the middle sponge. Drizzle everything with the fruit purée. Step 11 – To decorate, place the opened physalis around the edge of the middle sponge. 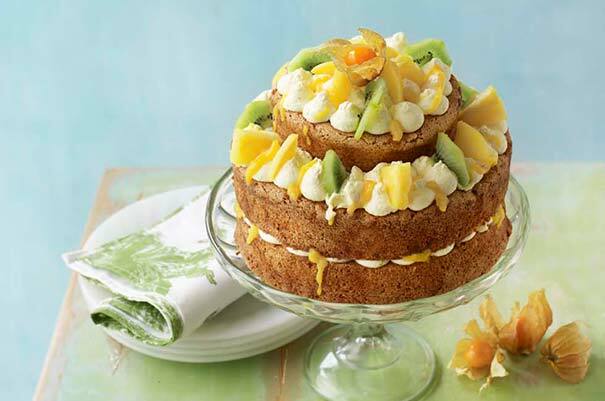 Arrange the mango, pineapple and kiwi slices on the top sponge. Place the hibiscus flowers to one side of the cake base.